The men's Olympic hockey tournament has been great so far in its first three games but...none of the top 6 projected teams have played against each other yet. Tomorrow they all come together in a day of 3 headline match-ups. Let's look at 'em. It's not the headliner on Sunday's slate of great games but this is the one I'm most excited about. Team Russia is absolutely STACKED with prime puck artists and they have two superstar goalies to back them up. They lost a tough game to a strong underdog Slovakian team and will look to make up for their "careless" effort. Team Czech has played spectacularly in their two games and Jaromir Jagr looks to be relishing his reappearance on the North American hockey stage. The 38-year-old has looked vintage. And netminder Tomas Vokoun looks like he might help steal the tournament from the projected powerhouses (Russia and Canada). 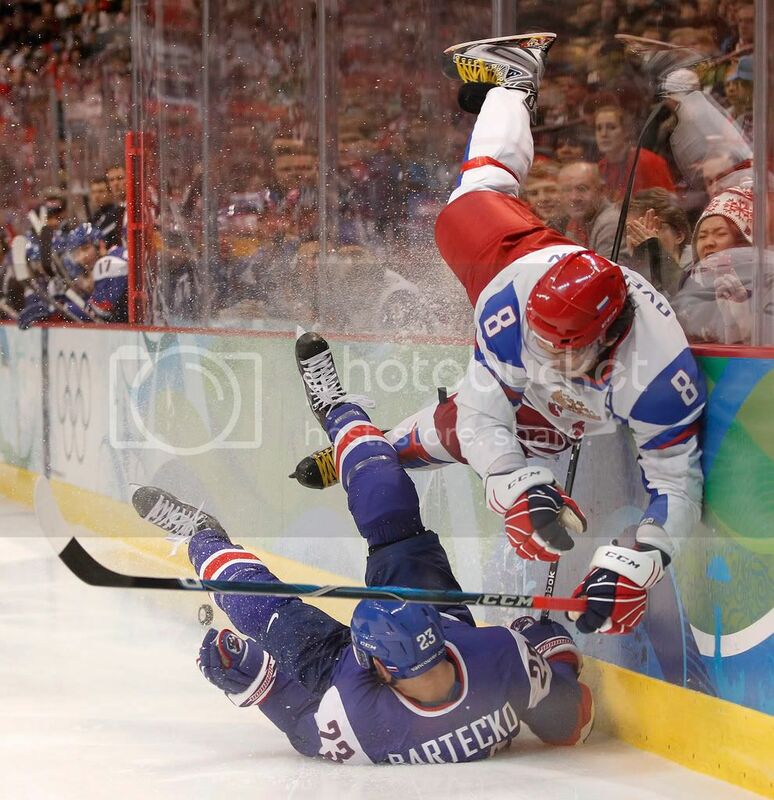 This ought to be an awesome game, but I'll take Russia strictly for the Almighty Ovechkin factor. In their first game, Canada absolutely annihilated Norway to the tune of 8-0 with Jarome Iginla recording a hat trick playing on a line with Sidney Crosby and Rick Nash. Their second contest was a little different. The built up a 2-0 lead but couldn't pile any more onto it as Swiss netminder Jonas Hiller was sensational, stopping 45 of 47 shots overall and all 18 shots he faced in the third period. Team Switzerland rallied, spurned by the efforts of their goalie and the pressure weighing down on the backs of Team Canada in their home country, and tied the game up with 10 seconds left. Sidney Crosby eventually won the game with a goal past Hiller in a shootout and Canada avoided a huge upset. Tomorrow they play Team USA and it should be a more competitive game than was expected to be coming into the tournament. Canada is immensely talented from top to bottom and their top 2 goalies (Martin Brodeur and Roberto Luongo) are perhaps the two best goalies in professional hockey. Team USA's roster was not held in such high regard coming into the tournament but they've come out and looked dominant. 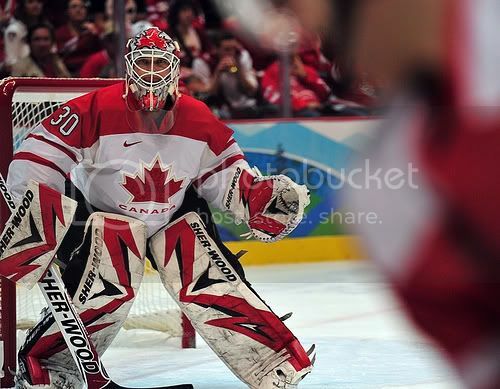 Their first game was only a 3-1 win over the Swiss but, again, Jonas Hiller was facing them. They absolutely destroyed Norway who tried to take the physical stuff up a notch but were steamrolled by USA's tough forwards (USA defenseman Brain Rafalski seemed to be taking a pounding by the aggressive Norwegians but he ended up with two goals). Team USA has looked great in their two games: they're controlling the play, being very physical and showing great chemistry pretty much from top to bottom. Goalie Ryan Miller has looked superb. The behemoth that is Team Canada has played well (even in the 2-1 win over the Swiss they absolutely dominated aside from the scoreboard) but they're under a ton of pressure and it was obvious in the Swiss game. If USA can score early, it's defense and goaltending is strong enough to possibly create an upset. 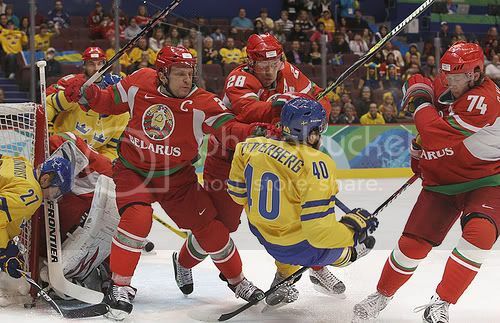 I haven't been at all impressed with defending-champion Team Sweden. They look like they've never played together and their opponents have been taking advantage of their lack of cohesiveness. They're also getting outworked physically. Team Finland has used a rough style of play depended on their strong defenseman and awesome goalies to dominate and win their two games by a combined score of 10-1. This will be yet another highly charged and emotionally competitive game but I see Finland knocking off the Swedes. Tomorrow looks to be a monumental day of hockey. If you'd looked at the day's match-ups a week ago, Russia/Canada/Sweden would look to be strong favorites but all of three of them have shown vulnerability against the tournament's weaker teams (aside from Slovakia*). The three underdogs have played very well and ALL 6 of the teams have absolutely superb goaltenders. Should be fun. *Slovakia is the strongest underdog team and embodies the midpoint between the six powerhouses (all the teams in action tomorrow) and the teams nobody thinks will win anything (Latvia, Germany, Norway, Belarus and Switzerland). The Slovaks have great starpower up front with the high-scoring Marians, Hossa and Gaborik, and crafty Pavol Demitra but lack any sort of depth, their defense is strong but unspectacular (witness stalwart 6 foot 9 Zdeno Chara being smashed off his feet by Ovechkin), and their goalie is very good but beatable. They are the team I would most enjoy seeing go for a historic medal run but it'd certainly be a surprise if they do.